It is with sadness that I have to report the death of John Barnes, film historian, collector, curator and filmmaker. John is best known for the five volume series The Beginnings of Cinema in England, 1894-1901, his unparalled study of the earliest years of English cinema. Begun in 1976, completed in 1998, it is as much a work of archaeology as historiography. John’s real passion was for the technology of film in the 1890s, and he was prodigious and exhaustive in tracking down every kind of motion picture machine from the period, explaining its distinctive qualities, tracing its use and recording its ownership. Around this deep understanding of the technology of the era, he weaved stories of the personalities of the time (his great hero was Robert Paul, whose battles with fellow pioneer and rival Birt Acres he recorded with journalistic fervour), the modes of exhibition, and especially the films – each volume of his history contained filmographies of the whole of British film production for one year, information gleaned from catalogues, journals, posters, flyers, and a host of other sources. Details of hundreds of films from this era have been identified from Barnes’ work alone, a huge benefit to scholars and film archivists alike. An era of cinema that previously had been idly documented and frequently misinterpreted was enriched by an exhaustive study that has inspired a huge range of subsequent studies. No one has been able to write about this period of cinema history without reference to the works of John Barnes. He found the material, provided the signposts, and his work remains the sure foundations on which all other research in the field must be built. John and his twin brother William (who survives him) were born in 1920 and discovered film during the 1930s, becoming enthusiastic amateur filmmakers while still at school. Two of their films, Gems of the Cornish Riviera (1936) and Cornish Nets (1938) featured at the Pordenone silent film festival in 1997, the year in which both were awarded the prestigious Prix Jean Mitry for services to silent film scholarship. 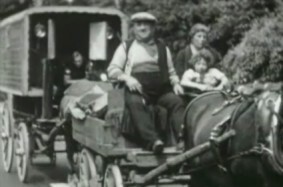 Eighteen of their silent films are now held by Screen Archive South East in Brighton, including The Wheat Harvest (c.1935), In the Garden of England (c.1938) and With the Gypsies in Kent (c.1938), clips from which can be seen on the Archive’s Screen Search site. 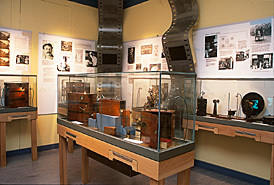 On leaving school the brothers studied film design and technique at Edward Carrick’s AAT film school, at which time they began collecting Victorian optical toys and associated literature, often frequenting the bookshops of London’s Cecil Court which three decades before had been ‘Flicker Alley’, home to the nascent British film industry. They hatched a plan to collect artefacts and documents that would trace the history of motion pictures from the 17th to the 20th centuries, an ambition put on hold while they served in the Royal Navy during the Second World War. After the war, the brothers moved to St Ives in Cornwall, where Bill opened a second-hand bookshop. It was in rooms above this shop in 1951, during the Festival of Britain, that the brothers put on the first exhibition of their film history artefacts, the success of which encouraged them to collect all the more. This was at a time when relatively little was appreciated about pre-cinema tchnologies, and John’s great work was not simply to collect such objects but to understand them, explain them and to be able to contextualise them. Eventually the bookshop was closed and the brothers sold by catalogue alone, supplying books and artefacts to scholars and film museums around the world. In the 1960s, while Bill went filming overseas, John and his wife Carmen (who also survives him) opened the Barnes Museum of Cinematography in St Ives. This famous collection attracted film scholars from around the world, and its catalogues became treasured documentary sources as serious interest grew in the roots of cinema. Collecting continued, and many objects were lent to museums around the world or formed the subject of illustrations in numerous text books. The Museum never found a London home, as John had hoped, and closed in 1986, its pre-cinema holdings going to the Museo Nazionale del Cinema in Turin, while much of the remainder is now housed in Hove Museum, near Brighton. But John’s greatest monument is The Beginnings of the Cinema in England. The series began in 1976 with the book of that title, which documented the arrival of film in England, 1894-1896. Establishing his style, the book traced the history through the machinery, out of which followed the personalities involved, the modes of exhibition, and a thorough filmography for the period. It would be hard to underestimate the value this book (which was revised and republished in 1998) to the early cinema specialist. It simply defined a period. Subsequent research has built on his work, and occasionally challenged its findings (Barnes’ arguments around the so-called ‘Paul-Acres camera’), but those solid foundations remain. It was followed by volumes doggedly documenting the cinema in Britain (he wavered between England and Britain in his descriptions) for 1897 (perhaps his best work), 1898, 1899 and 1900, the whole series eventually being republished in a uniform edition by University of Exeter Press in 1998. While the original volumes are quite rare, the re-issued set can be found relatively easily and cheaply and is strongly recommended to any serious student of early film. In the historiography of British film, only Denis Gifford and Rachael Low can match John Barnes’ achievements. 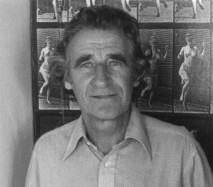 John Barnes devoted his life to the history of cinema. He was as much a pioneer in his field as were those whose lives and technologies he championed in theirs. He faced innumerable battles with publishers and institutions, but that all goes with the part played in being an independent scholar-collector. His knowledge, unfailing help and sturdy friendship were valued by scholars and enthusiasts around the world, and his parting (he died on June 1st) will be recognised as a huge loss. But few of us who work in this field will be able to leave behind so much of such solid and lasting value: objects rescued, identified and their importance recognised; documents saved, preserved and republished; films identified and treasured; and books written that preserve the knowledge of a lifetime and which will benefit research for many years to come. Enthusiasm is the key to John Barnes’ history. Perhaps the chief reason why this area of film studies is so vital, is that in the hearts of its enthusiasts it is as if it were happening now. While other areas of academic cinema history seem doomed to atrophy, as films that were once entertaining no longer entertain, Victorian cinema is alive with debate and discovery … This is perhaps Barnes’ greatest achievement, to have achieved the trick that film has always claimed to do, to abolish time. Thanks to the finest work of empirical early film history that there is, the cinema of the 1890s is very much with us still. Hand on heart, I think Barnes’ work has been namechecked on Screenonline more than that of any other single individual (there are thirteen citations across the site), and quite rightly – it’s a monumental achievement of almost incalculable importance to anyone interested in early cinema. I kept meaning to write him a letter of appreciation, and I’m sorry that I left it too late.